So that’s what I’ve decided to call this spring break. I’ll write it out again: the Stay of Teaching in Order to Knowledgify and Experiencify myself in Digital arts, which conveniently goes by the acronym STOKED. And when I say “Stay,” I just used that because it was the best synonym I could find online that means something like a break or a recess, and that starts with an S. Other options were “surcease” (far too extreme) “sixteenth rest” (and who knows what the hell that means), and “stoppage,” just to give you a sense of the alternatives out there. The art project has taken off. My friend Kathleen Egan is competing in the Trash Into Treasure art project, and I’m the cinematographer for the video submission that accompanies her artwork. She had a big work day yesterday and I was out there filming and taking pix in the blustery wind. 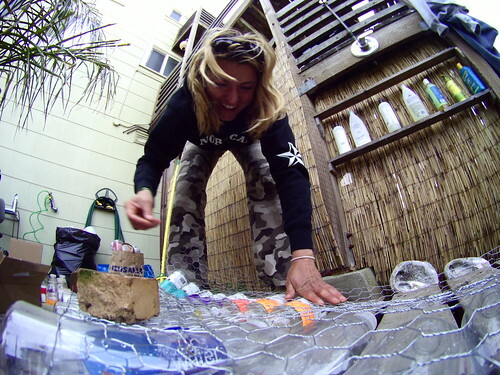 Her concept is awesome: she’s using weeks worth of used plastic, collected from a bunch of friends, and is using it all to make a stand-up wave, complete with a surfboard built inside of it. It’s already looking awesome, and is rather staggering to see how much plastic people regularly use. I’m loving working on this project and collaborating in an eco-friendly art project. Secondly, I took my loveable puppy out into the park today and shot a video for a video contest hosted by poptent.net. They are soliciting filmmakers for a dog to company to see what user-generated commercials might look like, and so to keep some of the creative juices flowing, I entered one. I think my little guy looks pretty cute in it, and I think it’s the type of commercial that would potentially get some good feedback. You can see the video by clicking here (I can’t embed it, sorry!). And, if you’re feeling ambitious, you can create an account in order to official “like it” or “comment on it,” and thus give the video that much more exposure. Coming down the pipeline: tons of audio recording for SonicSF, with storylines like the dog culture in San Francisco and an upcoming Surfrider protest against offshore drilling. Meanwhile, a photo shoot with I Live Here SF, a picture essay/blog about San Francisco and its residents. I’m really stoked about all of this. Big surprise, right? I really like the “I Live Here SF” blog…do you think I could submit some of the stuff I took for my senior project? Might be kind of interesting. Also, side note: technically, ‘myself’ and ‘arts’ should be included in your acronym. So really, it’s STOKEMDA. I can see how it’s slightly less catchy.